What was once a struggling trailer trying to engage with consumers at shows, sales, fairs and events – is now one of the most sought after meal sources thanks to the dedication of Dave and Rena Koning of Monroe. 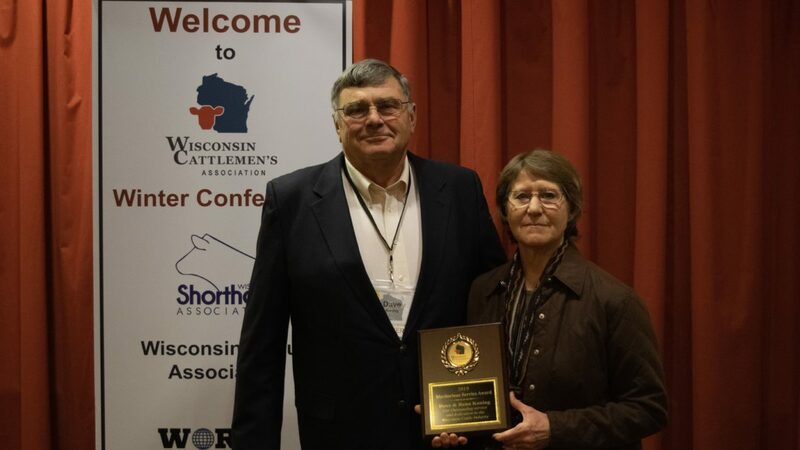 Friday evening, the Wisconsin Cattlemen presented their Meritorious Service Award to the couple as they turn over trailer duties in 2019, and focus on their own events building in Green County. More than 10 years ago, sales from the WCA Steak Trailer were not where the group had hoped. Dave explained to the audience that at the time, the WCA board saw 2/3 of their sales going toward burgers, with only a third investing in their ribeye steak sandwich. The board wanted to cut the ribeye and focus on the burger. Koning vowed that he’d only work with the project if the ribeye stayed on the menu. They agreed, and the challenge was on! Today, the Wisconsin Cattlemen’s Steak Trailer notes that 2/3 of their sales are now the ribeye sandwiches, with just a third the burger. Koning’s mission was complete. Over 30 years ago the pair came to Wisconsin and settled into Green County. The activities came naturally for the Koning’s – first the Green County Beef Producers, then the Green County Fair and the list just kept growing. Whether it’s helping grill for the WLBA Show Camp or sponsoring a different youth group or producer session – Dave and Rena are always there. They say not all of their decisions may have been the most rewarding financially, but if it helped a friend, neighbor, someone in the industry or community – it ultimately paid them the greatest reward.